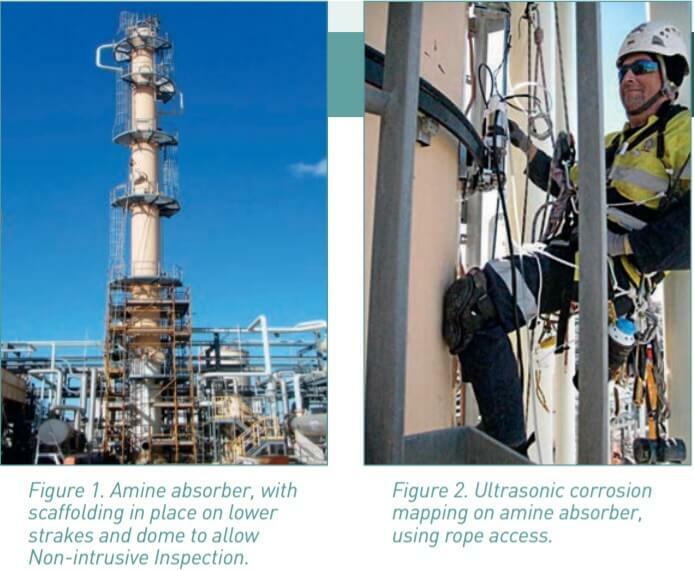 Takeaway: A pilot program of non-intrusive inspections was conducted, covering a total of eight process vessels, to avoid costly plant shutdowns. E. Jones and M. Cooper is affiliated with The Australasian Corrosion Association (ACA) and can be contacted using the options on the right. For info on how we work with industry partners click here. In this pilot program, the opportunity for non-intrusive inspection (NII) was brought about, at least in part, by the widespread implementation of risk based inspection (RBI) at the facility. Previous major outages were driven by prescriptive requirements for internal inspections of pressure vessels every four years (for most vessels). After risk based inspection was implemented, the internal inspection intervals were extended for many vessels, but there were a few remaining items still requiring internal inspection every four years. 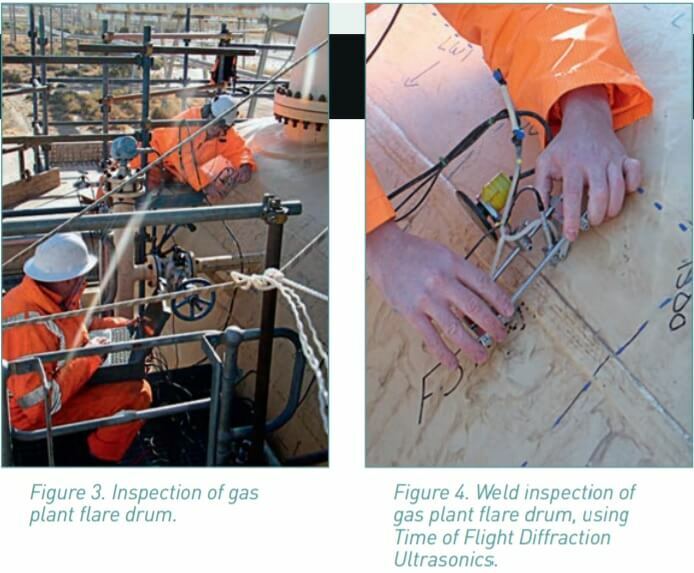 In particular, flare drums required shorter inspection intervals due to the greater variability in their service conditions and the modeled corrosion rates. Therefore the driver for non-intrusive inspection was to avoid costly plant shutdowns which were otherwise driven by a very few, or in some cases, a single vessel. (Other ways to manage vessel corrosion is discussed in Introduction to Managing Internal Corrosion in Process Vessels.) This made non-intrusive inspection a cost-effective option. What is a Non-intrusive Inspection? The commonly accepted definition of non-intrusive inspection is an inspection to determine the internal condition of the equipment without having to open the equipment. In practical terms the process uses conventional non-destructive testing with a detailed and planned scope, aiming to achieve an understanding of the internal condition that is at least equivalent to an internal inspection. The decision was made early on to employ a specialist inspection provider, with experience in scoping and execution of non-intrusive inspection. In this pilot study, the main non-destructive methods used were ultrasonic testing (UT), including ultrasonic corrosion mapping, radiographic testing (RT) and time of flight diffraction ultrasonics (TOFD). The time of flight technique was used to inspect for weld defects. The actual techniques used and the coverage required, for each particular inspection, would be a function of the identified degradation mechanisms for that equipment. Vessels were initially short listed on the basis of the next due inspection date. Eight vessels were selected, as shown in Table 1. From the table, it can be seen that the judicious application of non-intrusive inspection can avoid or defer major outages that would otherwise have significant impacts on production. An important driver in the field areas is the issue of the safety of confined space inspections, as a confined space entry in a remote site requires additional rescue personnel on standby. The planning required for this type of inspection commenced well before the inspection date; the minimum practical planning time was about three months. Planning was in two stages: a desktop review and an onsite evaluation. The desktop review included a review of the inspection histories and the existing risk based inspection model outputs. Advance preparations included scaffolding and the mobilizing of equipment and technicians to the site. A combination of rope and scaffold access was used for the onsite inspections. Scaffolds were completed at least two weeks prior to the start of work. Each of the specialist inspection technicians were paired with an onsite technician. This not only leveraged the advanced non-destructive testing skills, but also expedited the start of the work by including personnel already familiar with the site. An additional technician was supplied to the site for the purposes of data collation for forwarding to the engineering team. This allowed for timely review of the data collected by offsite engineers, so that anomalies could be identified and additional testing expedited, while access was available and the equipment and technicians were still on site. Selected photographs from the inspections are shown in Figures 1 – 4. In all cases the required inspection interval was achieved. As expected, no immediate concerns were noted from the inspections; this meant that no intrusive inspection activities were required before the next inspection. Cost savings were mostly attributed to delay of outages and in one case delaying a total plant outage. In terms of direct inspection costs, the non-intrusive inspection was about twice that of conventional intrusive visual inspections, for a simple vessel. For a reasonably large vessel of simple construction (such as a flare drum), the duration of the work was about ten shifts (of ten hours each), for a team of two technicians.